We went out for a really funky dinner on a farm on Saturday night. The restaurant was this kind of renovated wooden barn thing - all the meat eaters got to eat a special kind of local cow, while I got a yummy fish dish - it was a really nice evening. 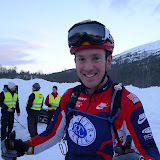 On Sunday there was a 'two person teams race, Chris raced with a speedy Norwegian who kept him on his toes. In the meantime our little group skied up valley and explored a spectacular frozen waterfall. We then skied higher up the hillside and found an amazing old hut where they apparently used to store the hay during winter and would come up on horses to retrieve it when supplies got low down in the valley. From the hut we enjoyed some nice powder descent back down to the farmstead. Then it was time to pack up and hit the very ice road back to Trondheim - the temperatures had risen a lot and it was raining, creating dangerous ice every where, yuck! Luckily we made it home safely.